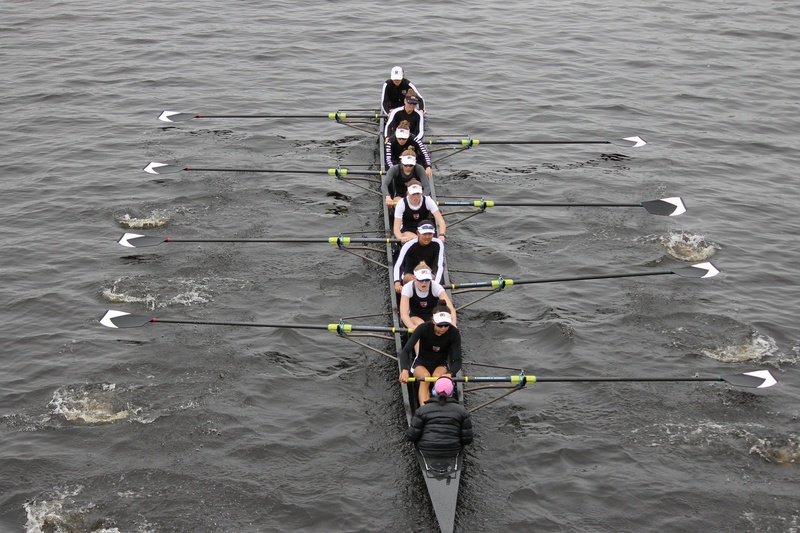 Rowers compete in the Head of the Charles Regatta in October. The regatta was one of the sporting events student marketing officers helped promote. A number of student athletes on Harvard’s 42 varsity teams have taken on another role this year: Chief Marketing Officer. In Sept. 2017 the Athletics Department announced a new student marketing program in which an athlete from each team would work with the marketing department in Athletics to increase communication between student athletes and the department. In the two semesters since the program was announced, CMOs have assisted the marketing department in tailoring promotional content and featured events to their individual teams and increasing student engagement in athletics. Grace C. Eysenbach 20’, one of two CMOs for women’s heavyweight crew, said she helped the marketing department draw more students to her team’s events. Associate Director of Athletics Susan Byrne wrote in an email that the CMOs have increased student attendance at sporting events. Byrne cited an initiative to better publicize track and field events, led by team CMO Randy R. Raymond ’18, as an example of a successful collaboration with the CMOs. Byrne also wrote that the CMOs have been helping the Athletics Department step up its social media presence, especially on Instagram. Though many of the CMOs have worked closely with the marketing department over the course of the year, some students have worked more closely with their teams to create team-specific projects. Baseball player Hunter B. Bigge ’20 arranged for his team to send 100 thank you letters to former players. Bigge said the project was part of a larger goal to increase connections between current players and alumni. Many student-athletes took on the role of CMO on top of already busy schedules. The CMOs agreed, though, that the role has not required a major time commitment. Bigge said the self-driven nature of the role allows him to work on his CMO projects in his free time. Ski team CMO Allegra B. Colman ’21 said she wasn’t quite sure what she was signing up for when she volunteered to be her team’s CMO at the beginning of the year, but she said she has enjoyed her job. As the end of the student athlete marketing program’s first year approaches, Byrne wrote that her department is looking forward to building off of the momentum that this year’s CMOs have created. While it is up to the teams to decide who will be CMO next year, a number of the CMOs said they are hopeful they can continue in their role. With free t-shirts and pizza, Harvard’s Athletics Department is successfully luring increasing numbers of students across the river to attend varsity sports games through its CrimZone Rewards program and has doubled attendance at select games.